We’re grateful that we are supported by the generous donations of individuals and organizations in the communities we serve. Since our founding in 1963 in Southern California, we have also looked for creative ways to give back to those communities. With our primary outreach focused on substance abuse prevention, we take teams of students to schools, churches and other public events to spread the message that drugs are not the answer. We also have established after-school learning centers that tutor at-risk youth, and incorporate many other approaches to decrease the number of people who become addicted and need our residential programs. A weekly club meeting for neighborhood children that features Bible stories, scripture memorization, singing, games, crafts, recreation, summer camps and more. This weekly discipleship group is an innovative initiative especially designed for gang members and former gang members. This highly successful discipleship program offers Bible studies, counseling, camping programs, and participative leadership activities. Innovative and relevant presentations encourage young people to say no to drugs and yes to life. Teen Challenge teams regularly visit needy neighborhoods and conduct Christian-oriented drug and alcohol prevention programs. A combination of academic and mentoring programs designed to meet the needs of students in urban communities who are most at risk of academic and social failure. Supplementary educational and enrichment components include tutoring and mentoring (with trained volunteer tutors), computer and technological opportunities, family-related workshops and counseling, and leadership formation activities. Teen Challenge has established several after-school learning centers and prevention programs designed to encourage children and youth to achieve their highest academic and individual potential. After-school learning centers provide educational components that include tutoring and mentoring (volunteers), technological opportunities, family-related workshops and counseling, leadership formation activities, quality partnerships and individual relationships. Our Adult Educational Learning and Tutorial Centers serve hundreds of adults each year. These facilities are located in our residential substance abuse recovery centers and are equipped with computers and software designed to increase computer and vocational skills and to supplement employment readiness classes. Many of these learning centers in Southern California are open to the community. Our school presentation teams visit schools, from kindergarten through high school, putting on shows for the kids. For the younger ones, there is a puppet show and for the older ones, skits that are both fun and informative. There is a definite message in the skits, most often an anti-drug or “school is cool” theme. In addition, between skits, members of the team give personal testimonies of their past life of drug abuse and how Teen Challenge has given them a chance at a new life. One of the many ways Teen Challenge serves the community is through our New Creation Drama Teams. Comprised of 10 to 15 Teen Challenge students, the drama teams are a very effective and fun way of reaching out to the community. Like our school team presentations, there is a definite message in the skits, most often an anti-drug message. In churches and in public community programs, members of the drama team also give personal testimonies of their past life of drug abuse and how Christ and Teen Challenge have given them a chance at a new life. Every week, a team of Teen Challenge students and staff members visits juvenile hall. Our students believe that by reaching out to these troubled youths and sharing how Christ and Teen Challenge have helped them to turn their lives around, they will give these teens the hope they need to know that they are capable of making similar changes in their own lives. Teams are invited into private and public schools to present informative, age-relevant presentations that encourage young people not to use drugs. Those who are already using drugs are counseled. The New Creation Choir is a group of students who sing and provide testimonies. They travel to local churches and organizations all over Southern California. So many people in the community are directly affected by the tragedy of drug abuse. Either they are personally involved with drugs or a son, daughter, mother, father, friend, or other loved one is being devastated by dangerous drugs. Through inspiring songs and life-changing testimonies, the New Creation Choir always offers a ray of hope to anyone who sees and hears them. If you would like to have the choir visit your church or school or organization in Southern California, contact the center nearest you. 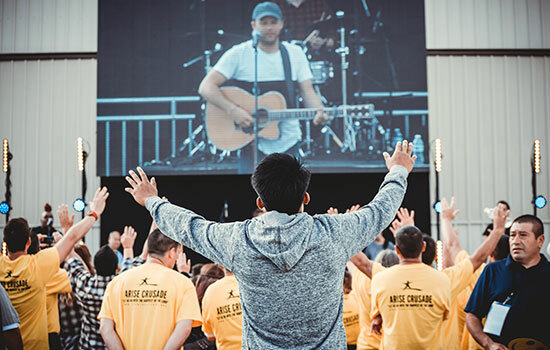 Teen Challenge of Southern California’s ARISE Crusades are evangelistic outreaches into our local communities to spread the Good News. For more information (click here).